Duluth International Airport is operated by the City of Duluth and serves as a joint civil/military airport. Sitting on 3,020 acres, KDLH is the primary commercial airport serving the Duluth/Superior area. There are 65 civilian aircraft based here, including 49 single-engine props, ten multi-engine props, three jets, and three helicopters. The Minnesota Air National Guard has an F-16 fighter wing based here, with 21 military aircraft. FAA ATC services are provided 24/7. FAA data shows there were 61,446 operations in 2012. 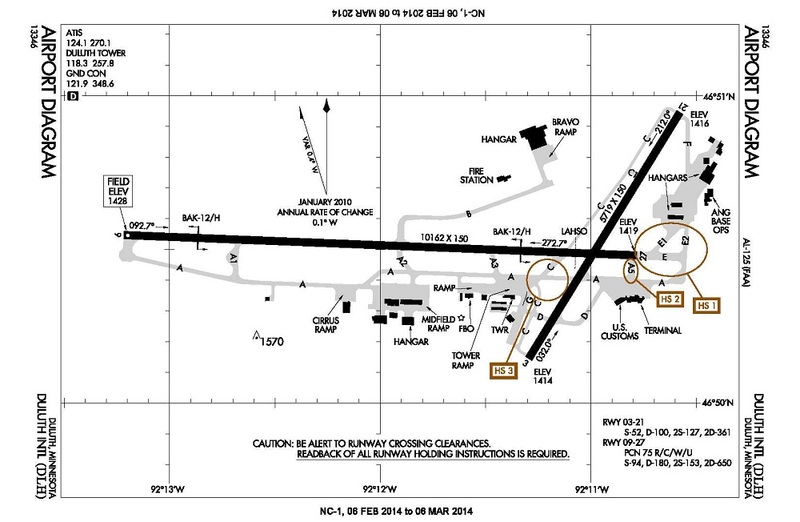 This averages out to four takeoffs per hour of ATC operation, or an average of seventeen-minutes between takeoffs. This has never been a busy commercial airport. Airlines offer regional/commuter feeder service to O’Hare, Minneapolis, and Detroit. Allegiant flies to Florida, Nevada and Arizona. FAA compiles ATADS data for this facility. Airport operations in 2012 were DOWN 11% vs. 2007 operations, and DOWN 19% from the peak year (2003). …A blog by Trisha Volpe, at Minnesota Public Radio. She details progress being made at the airports in Duluth and Superior, including: (1) recovery of the large hangar abandoned when Northwest went bankrupt (now an AAR commercial maintenance facility); (2) Cirrus, which saw very lean years during the down economy but is now ramping up production with a new single-engine personal jet; and (3) Alan Klapmeier’s Kestrel turboprop project, aimed at corporate flyers, and being developed at Superior Airport (NOTE: Klepmeier founded Cirrus but left the manufacturer shortly after it was bought up by a Chinese company in 2011). …The $78 Million project officially opened on 1/14/13.